I am looking for help to improve this zero-cross detecting / triac triggering code that I've implemented on an ATtiny85. It is working without problems on a 220V / 50Hz mains, but I would like to get rid, if possible (I suspect it is, but I can not make it work), of the two timer ISRs I'm using at the moment. Now it works this way: the ZCD pulses present in PCINT3 activate the pin change ISR (I can not use INT0 because I am using I2C). This ISR resets the Timer1 counter, configured in CTC mode, and puts it to count. Upon reaching the selected OCR1C value, the compare match ISR is activated, where PB1, which controls the triac gate, is put on high. This same ISR sets the Timer1 counter to overflow 3 or 4 ticks later, managing the duration of the triac start pulse. Finally, the Timer1 overflow ISR puts in low PB1 and turns off the triac. Would it be possible to achieve the same operation by making timer1 activate/deactivate OC1A? Thus discarding the Timer interrupts that I am using? It would be helpful to know the purpose of mounting this snip-hunting expedition. If it works, what is the impetus to change? Are ISRs frowned upon by the elders? Is this "full Monte" -- err, "full Arduino"? Or just a vanilla C app written in Arduino style? (I can not use INT0 because I am using I2C). How many metaphors are mixed in that statement? Now I have to dig out a representative datasheet...how many interrupt sources are there for that model? How many coupld be put into play? As this model has no inherent I2C, what does it matter? A couple ISRs might make sense to me. After all, mains work is slow, right? Many milliseconds between events. One could employ, besides e.g INT0, analog comparator or T0 which also overlaps INT0. No ICP on this model. Depending on the reach of the numbers from the zero crossing and accuracy needs, perhaps there are 'single hit" solutions. More numbers are needed. I don't think that using the hardware compare will eliminate your timer isrs - you still need to load the next event once you get a match. The only advantage I can see is that you might eliminate the isr latency when activating the port pin. You could program the timer in PWM mode with the intended low and high times. Output the PWM wave to PB1. Then, the pin change interrupt only needs to start the timer, while the overflow stops it (via prescaler). PWM mode auto-resets the timer, so this method has less interrupts and they do a bit less work. Well, my goal is to get cleaner, less intricate code and, as Kartman mentions, eliminate the latency of 2 ISRs, and maybe save some bytes in flash memory. One last point is to learn something new. Is this "Full Mount" - err, "full Arduino"? Or simply a Vanilla C application written in Arduino style? How many sources of interruption are there for that model? How many could be put in play? I have not described the entire application to keep the focus on eliminating the Timer1 ISRs, but the tiny85 pins that I am using at this moment are: 5 (I2C SDA), 7 (I2C SCL), 6 (Triac gate control output), 3 (ADC2 to calculate current through a hall effect sensor), 2 (Zero cross pulse input). This AVR is a kind of "AC handling I2C device" working as a slave to another MCU. A pair of ISR could make sense to me. After all, network work is slow, right? Many milliseconds between events. That's true, in fact, 10 ms between PCINT3 ISR activations. 100 zero crossing detections per second at 50 Hz. You could use, in addition to, for example, INT0, the analog comparator or T0, which also overlaps INT0. As mentioned above, the pins I am already using leave out INT0 and T0. At some point in this development I thought about implementing the zero crossing detection with ADC3 samples, that would save me a couple of components in the circuit, but I discarded it because I did not get reliable results with the code. The only advantage I can see is that you might eliminate the isr latency when activating the port pin. Hi El tangas! thanks for your answer! OC1x Set on compare match. Cleared when TCNT1= $00. My problem is that I don't know how. I'm very confused with the TCCR1 options I need for this (and overall datasheet redaction within Timer1 section). Do I need to set CTC1=0, PWM1A=1, COM1A1=1 and COM1A0=1? In such case, what OCR register should I use for the compare match? Is it OCR1A? or OCR1C like in CTC mode? My application needs to control at what point (timer tic count) after the pin change interrupt starts the timer, the triac is triggered, do I get this with the overflow? Why not just always set PB1=0 in the PCINT0 interrupt ? (You will get a variable pulse-width though). Use OCR1A for the width. - unwanted full-cycle turn-on when the mains-frequency decreases below the PWM frequency. (because COM1A will still be high after the zero-crossing). I've already tried that approach. The good thing is that it saves you the overflow ISR to turn PB1 off, bad thing is that, in practice, when PCINT ISR is executed, the real AC mains sine wave is positioned slightly after the zero point (at least with my HW), so It's too late to try to turn the triac off. The actual effect is that the triac sometimes goes off, sometimes not. Actually your ISRs are very simple and could be written in assembly, this would save a lot of ISR overhead. Don't get me started on that again. I can dig up many references to past battles, and/or you cn use this one as an example. Make sure to identify this "overhead" as being related to the language chosen versus the toolchain (and its application) chosen. The good thing is that it saves you the overflow ISR to turn PB1 off, bad thing is that, in practice, when PCINT ISR is executed, the real AC mains sine wave is positioned slightly after the zero point (at least with my HW), so It's too late to try to turn the triac off. I'm not versed in this mains/triac manipulation. It would seem strange to me that the "holdoff" would be a full half cycle or more. Guess I need to read up on typical firing sequences. I guess a slow main clock and high prescaler would give enough reach, even with only 8-bit timers available. Only r24 needs to be saved, the flags are not changed, r0 and r1 are not used, so why are they saved and restored? That's some 8 cycles overhead on entry, somewhat less on exit. That is one of the points, choice of toolchain, that we may get to later. 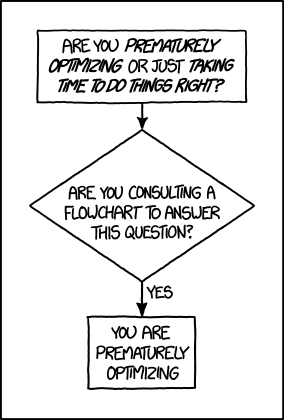 Because >>you<< chose to use that toolchain, and apply it in a particular manner. Now, one can adjust one's tools. In this case, if indeed critical, there can be a dedicated SREG register; there can be dedicated register variables for ISR use. Who knows? Maybe the OP is actually using CodeVision, the toolchain was not mentioned. Myself, I'm indeed very interested to know how to reduce the overhead in gcc. Georg-Johann has made changes in avr-gcc regarding the ISR overhead, but they haven't arrived in the released version yet. I'm not versed in this mains/triac manipulation. It would seem strange to me that the "holdoff" would be a full half cycle or more. The problem with mikech's suggestion in post #8, is that setting PB1 = 0 within the PCINT ISR, produces an output like that of the medium to the right. As you can see, it is too late for the triac to turn off, since the sine wave is no longer on zero. The code in the OP (the one I would like to improve) produces a pulse on PB1 nevertheless, as shown in the lower right, which allows a non-compromised triac switch off. So have you tried PWM? Then just put the desired timings in OCR1A and OCR1C. If I understood the datasheet correctly, this should work, but I can't test. @OP: So have you tried PWM? 3. These changes produce a .hex file 94 bytes smaller, around 10% less to get the same operation! However, I have kept the Timer1 compare match ISR in the tests I did so far. This is to force the timer overflow by using "TCNT1 = (255 - PULSELENGTH);", so preserving the pulse behavior on PB1. Because if it's really like that, I could control the triac trigger pulse delay with OCR1A and the duration of the pulse with OCR1C, also eliminating the compare match ISR. I expected the start-of-a-cycle edge-detection to occur slightly after the start of a cycle, but I did not expect the end-of-a-cycle edge-detection to occur *after* the end of the cycle. I am curious top see the actual ZCD circuit. 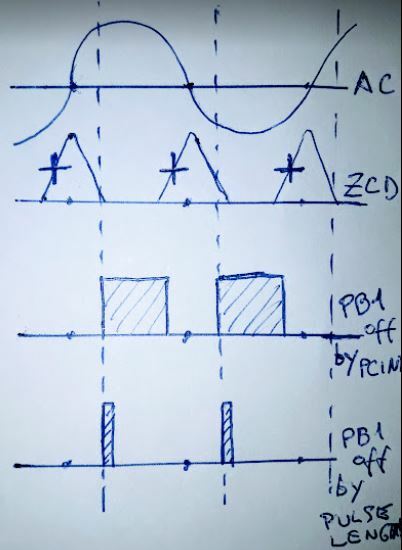 The time between edge-detection and triac triggering is controlled (delayed on purpose) by OCR1C (OCR1A in PWM) to control power on the AC load. 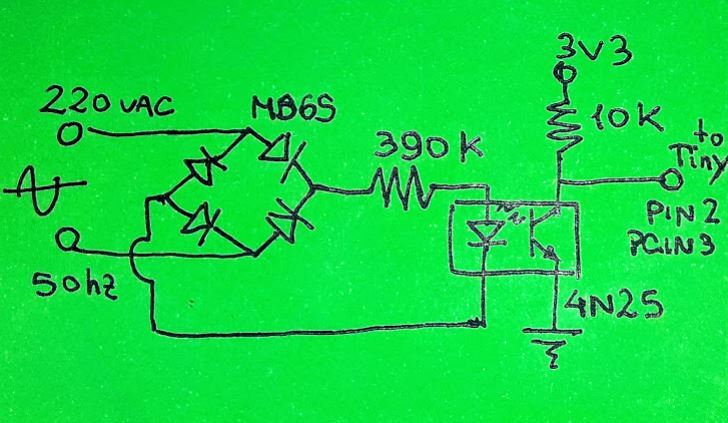 I'm triggering the triac with a MOC3052 opto. Thanks for the simulation! Now I remember better (I did this part very early in the project), the peaks are aligned with the zeros of the AC sine wave thanks to the "NPNness" of the opto, right? So, the Tiny85 efective "zero" detection occurs at some point of the ZCD signal rising edge. This is what brought me some complications at the beginning since the point of detection was not completely stable. Maybe with a little more work to better adjust the ZCD electronics this can be solved and the pin change ISR can be used to turn the triac control pin off (3rd graphic). Anyway, I insist, IMO it is better to use a short pulse (the shortest supported by the triac) for the triggering (4th graphic). Why risk that the triac does not turn off on time by playing at the limit? Finally, I was able to repair the ZCD and test everything: The PWM approach worked perfectly! I can confirm that a match of TCNT1 with OCR1A puts PB1 on high, and a match with OCR1C puts it on low. The aim of this post have been fully fulfilled for me, thank you very much to all for helping me to understand better how to configure the timer in PWM. I publish the latest version of the code below, in case it is useful for someone. With some adjustment, it is also possible to use PWM for power control applications in low frequency (50 - 60 Hz), I thought differently at the beginning of the project. The comparison match ISR was also eliminated so that no ISR associated with the timer is longer used (less latency). Only the pin change ISR is used for the zero crossing detection (maybe in the future I'll work again on the possibility of doing this with samples of the ADC, since it would have the extra advantage of being able to "measure" the AC line voltage). avr-size shows 290 bytes with this code, vs 344 bytes of the OP CTC version, this is around 15% less flash memory for the same function. Next step for me is to get the smallest possible piece of code for line frequency autodetection (the gadget should be aware of whether is plugged into a 50 or 60 Hz mains). 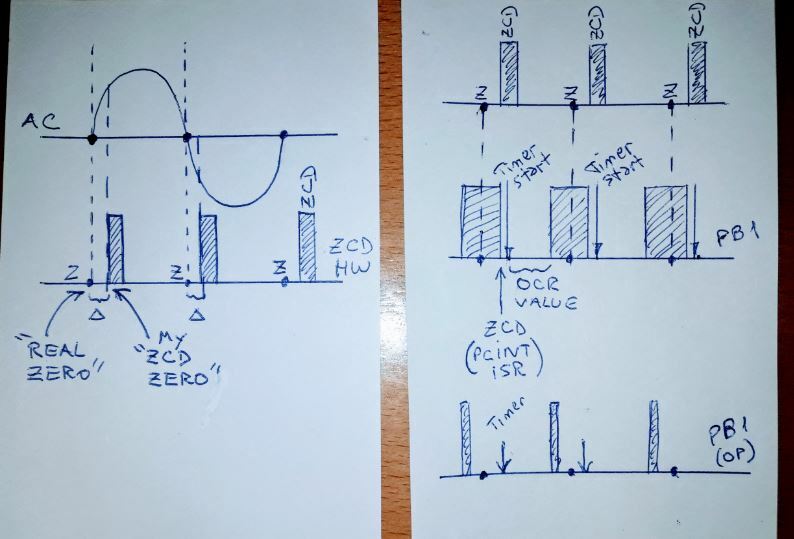 Centres the pulse around actual ZC, making it easy to predict the actual ZC by remembering the timing of (one or more) previous pulse(s). Not bad at all, thank you! I just pick off the ac from the secondary of the transformer, a little filtering then into the input capture. My code uses a phase lock loop technique to recover the zero cross and provide phase correction. It probably wouldn’t work too well using an 8 bit timer. Also, with the zx link, it is not a good idea to use 1/8w resistors on 240vac - the voltage rating is not adequate. All components are low cost and low voltage types (<10V), with the exception that R1 and R2 must sustain each half of the maximum peak mains voltage (200 volts). R2 can be omitted if R1 alone can sustain the maximum peak input voltage. In this case use a 390kohm standard resistor. Splitting the input resistor into two (halving the voltage handling requirement) makes it possible to use only SMD-components. My code uses a phase lock loop technique to recover the zero cross and provide phase correction. That's roughly my next step, but I don't have a transformer working at line frequency in my design. So I'll have to pick the AC amplitude and frequency out of an optotransistor. The circuit works at 3v3, so the sine wave would have that Vpp amplitude at the most. Not sure if it's going to be reliable for "measuring" voltage, but should be enough to infer the zero cross, what do you think? And yes, only 8-bit timers available on the Tiny85.